NEW YORK – Disney’s live-action adaptation of its beloved 1991 animated film “Beauty and the Beast” arrives in theaters amid a swirl of controversy over the updating of one of its characters into an openly gay man. The decision of the studio, director Bill Condon (“Dreamgirls”), and screenwriters Stephen Chbosky and Evan Spiliotopoulos to reimagine LeFou (Josh Gad), sidekick of the villainous Gaston (Luke Evans), as Disney’s so-called “first gay character” is a regrettable one. A cherished family film has, in essence, been appropriated for an underlying agenda that is firmly at odds with Christian values. Parents will have a hard time explaining to their kids – as most know the cartoon by heart – why LeFou has jumped on the homosexual bandwagon. His amorous advances to Gaston, proud display of a bite mark from Gaston on his stomach (due to “wrestling”), and ultimate dance in the arms of another man will raise eyebrows, to say the least. Admittedly, many grown moviegoers will take LeFou’s transformation in stride. 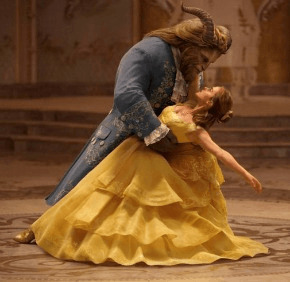 “Beauty and the Beast,” however, is a must-see film intended for children. Given the clear intent to make a statement with the character in question, the restrictive classification assigned below is a caution for viewers of faith, especially parents. The pall cast over “Beauty and the Beast” is unfortunate, as the film is largely an imaginative and engaging work with an arresting visual style. An old-fashioned Hollywood musical at heart, it brims with familiar songs by Alan Menken and whirling dance sequences worthy of Busby Berkeley. Like the cartoon, this film is loosely based on the 1740 fairy tale by Gabrielle-Suzanne Barbot de Villeneuve. The eponymous lovely, Belle (Emma Watson), is a spirited maiden in a French village who longs for excitement. Be careful what you wish for, dearie. No sooner does she spurn the advances of the vain hunter Gaston than Belle winds up imprisoned in a haunted castle, having swapped places with her kidnapped father, Maurice (Kevin Kline). Enter said Beast (Dan Stevens), aka The Prince. We learn in an extended prologue that this handsome royal was transferred into a horned (but infinitely more dapper) version of Chewbacca from the “Star Wars” franchise by Agathe (Hattie Morahan), a local enchantress, as punishment for his selfishness. Agathe’s curse extended to The Prince’s staff, who became not furry creatures but household objects. These exceedingly loquacious items include Cogsworth (Ian McKellen), a stuffy mantel clock; Lumiere (Ewan McGregor), a dancing candelabra; twirling feather duster Plumette (Gugu Mbatha-Raw); Mrs. Potts (Emma Thompson), a motherly teapot, and her cup of a son, Chip (Nathan Mack); and musical duo Cadenza (Stanley Tucci), a harspichord, and Garderobe (Audra McDonald), a wardrobe. Only if Beauty grows to love the Beast will the spell be broken, which seems a very long shot for this odd couple. A courtship ensues — with a nice lesson on looking beyond outward appearances for true love — until a vengeful Gaston raises an angry mob to kill the Beast, casting doubt (for newcomers, at least) on a happy ending. Even in the absence of the hot-button issue already discussed, young children might be frightened by several dark moments in the movie, including attacks by wolves and Gaston’s violent assault on the Beast’s castle. The film contains a few scenes of peril and action violence, a benign view of homosexual activity, and some sexual innuendo. The Catholic News Service classification is L – limited adult audience, films whose problematic content many adults would find troubling. The Motion Picture Association of America rating is PG – parental guidance suggested. Some material may not be suitable for children.